Practical Magic at Smith’s St. Leonard? Alex Glass contemplates mapping the cellar floor brick. The field crew has been taking advantage of this unseasonably nice weather to continue exploring the presumed storehouse cellar at the Smith St. Leonard site. The test unit now reaches almost six feet below the ground surface and the hoped-for brick floor (see blog entry from November 19th) has finally emerged. The projecting area of brick at the lower right of the photograph is either part of a bulkhead entrance into the cellar or part of a brick hearth. Diagnostic artifacts remain elusive, so we are still unsure when the cellar was filled. 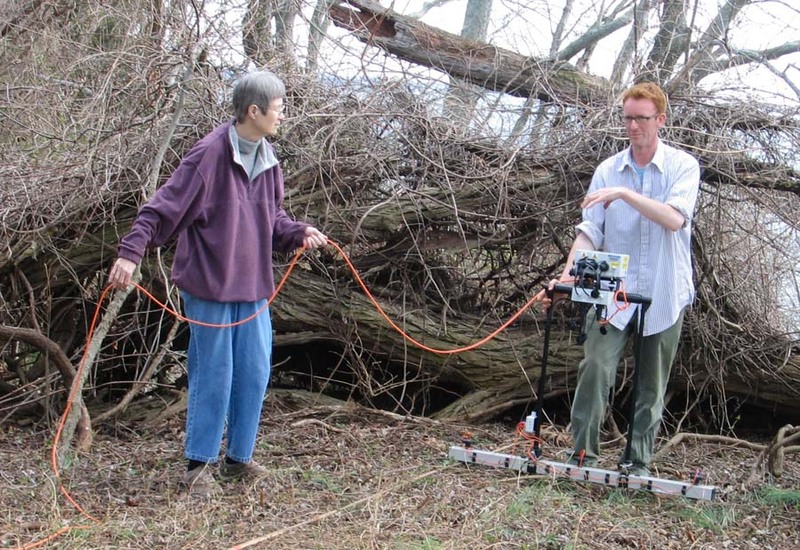 Earlier in 2012, JPPM hired geophysicist Tim Horsley to conduct three different types of remote sensing—ground penetrating radar, magnetometer, and soil resistivity—across the Smith’s St. Leonard site. These types of geophysical surveys can help reveal the locations of subsurface disturbances such as wells, privies, and building cellars prior to putting a shovel into the ground, and are a valuable tool for helping plan excavation. 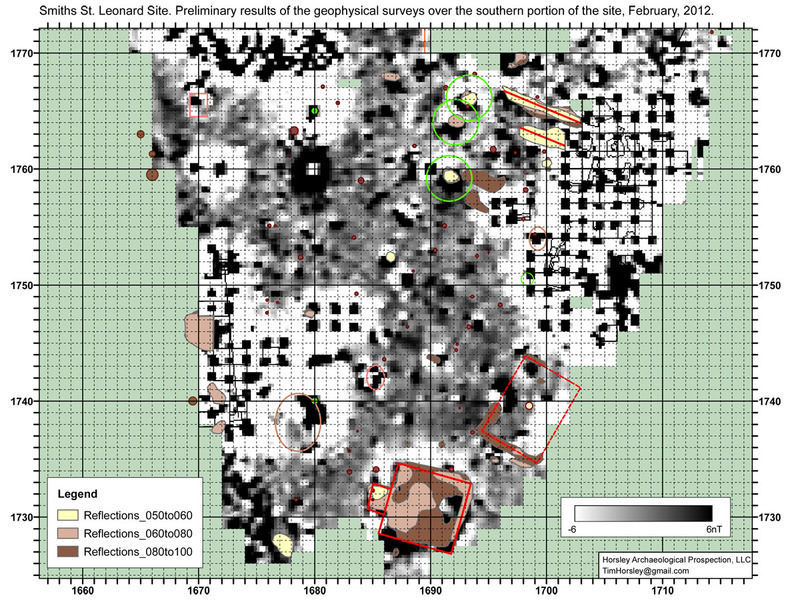 Tim observed numerous subsurface anomalies, including a large, deep anomaly in the area where an eighteenth-century storehouse may have been located. Volunteer Christa Conant assists Tim Horsley with soil resistivity testing at the Smith’s St. Leonard site. The red outlined box at the lower right depicts the projected location of the cellar. Alex, Ed and Annette worked throughout the summer and fall to remove the overlying plowed soil from areas where Tim’s testing had found anomalies. In every location that Tim predicted a subsurface feature, the digging showed the accuracy of his testing. As October drew to an end, the decision was made to test the possible storehouse cellar. 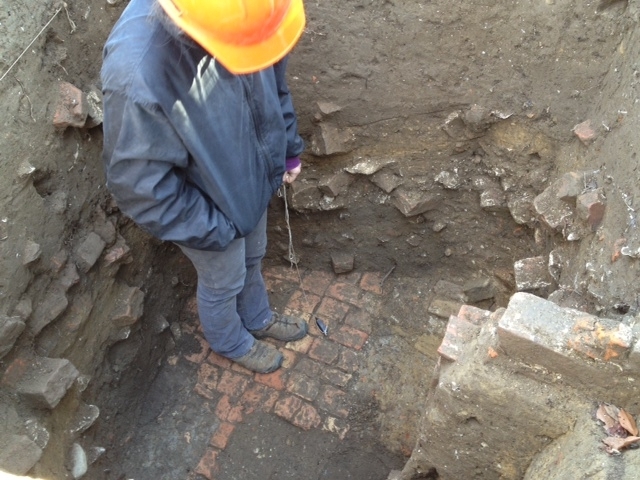 Tim predicted that this 20 by 20 ft. feature would contain large quantities of brick at a depth of about four feet. 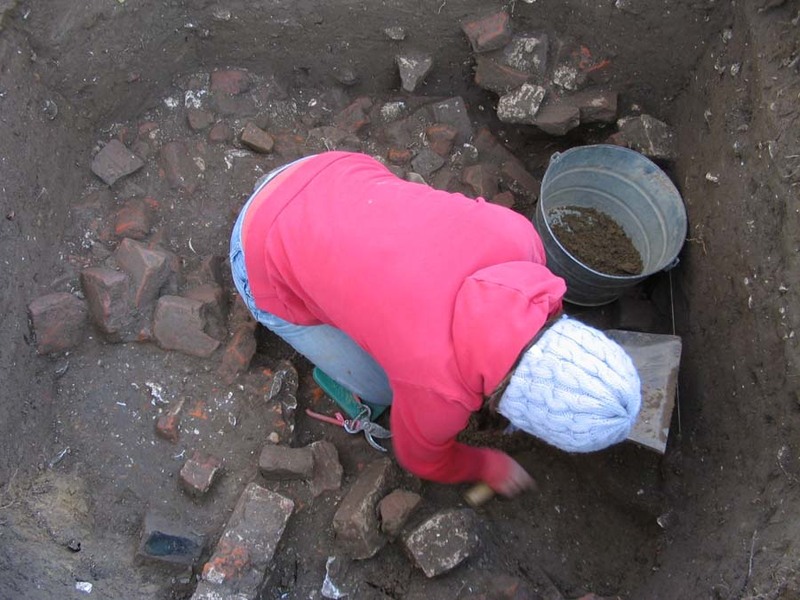 Field technician Alex Glass has the unenviable task of balancing on brick rubble as she digs! And sure enough, after several days of careful troweling, Alex and Annette came upon a layer of brick rubble, about three feet under the ground surface! Way to go, Tim! The rubble has been removed and preliminary testing suggests that the cellar fill extends at least another foot or so deeper, possibly bottoming out on a brick floor. Unfortunately, the cellar soil has not been particularly artifact-rich, so we don’t yet have a good date on the filling of the cellar. In addition to wine bottle glass, oyster shell, and a few fragmented white clay tobacco pipes, the crew did find this nice brass buckle. 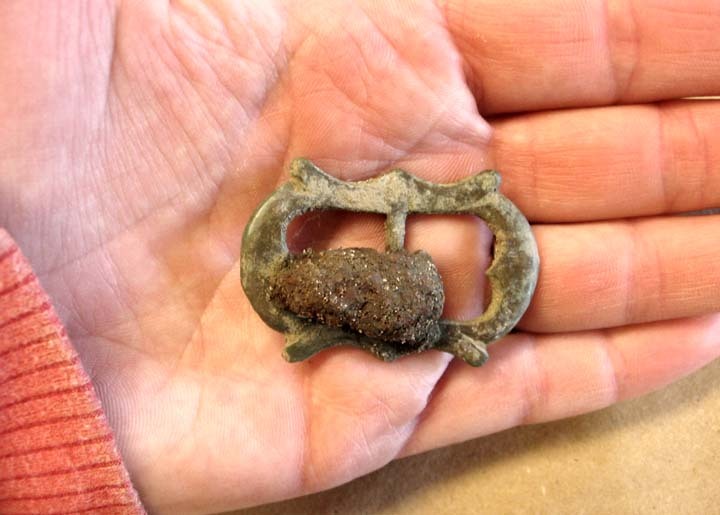 Curator Sara Rivers Cofield believes it could have been part of a horse harness. We hope that continued work in the cellar will yield further clues about the function of the building and its construction and destruction dates. 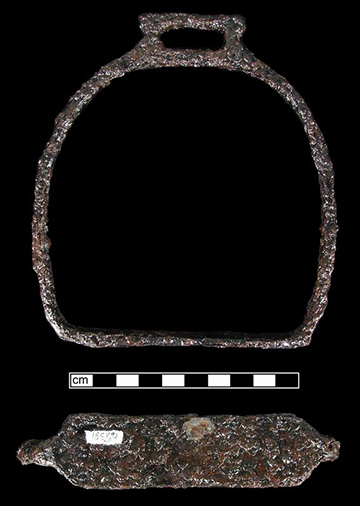 Ornately shaped brass buckle from the cellar fill. 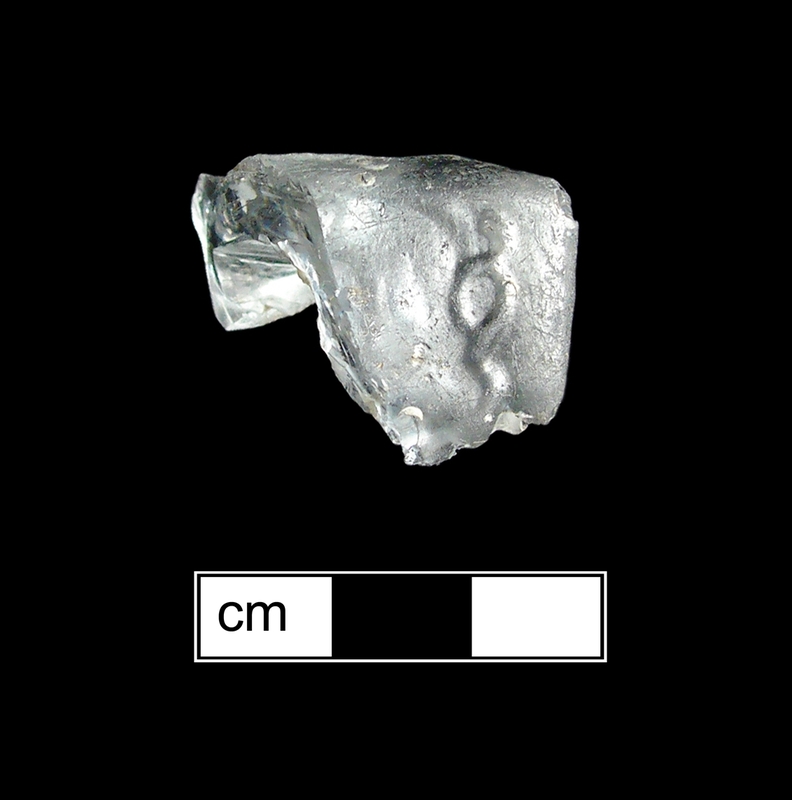 A few months ago at the Smith’s St. Leonard site, volunteers and crew discovered a small colorless glass fragment. 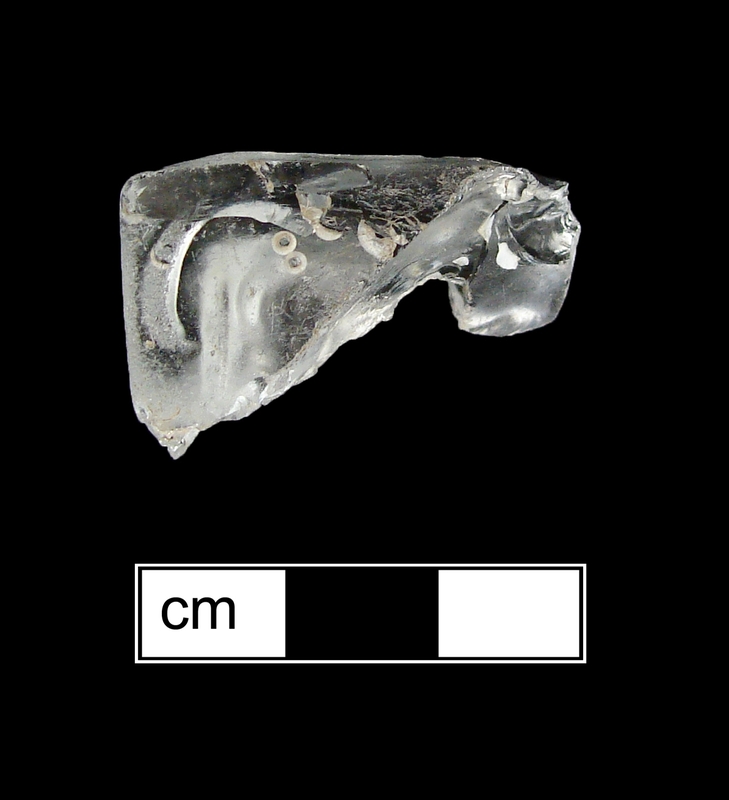 Finding glass at an archaeological site is not that unusual since it preserves fairly well in the ground. So what makes this little fragment so blog worthy you ask? This piece is very thick, with a square shape and curved figures molded on the sides. We were a little stumped when the piece was initially found. What type of vessel was it from? Is the molding a design or letters? Is it even contemporary to the site (1711-1754)? Left scratching our heads, the artifact was put back into its bags and we continued with fieldwork.